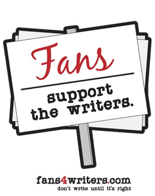 In today's episode, I wrap up a series of recordings made last week when the membership of the Writers Guild of America voted to lift the restraining order and end the strike. The proposed contract is pending a vote next week. Here I meet with two people who are not writers: attorney Jonathan Handel from the law firm TroyGould, and Damon D'Amato, a teleprompter operator who has also been covering the strike as a citizen photojournalist. Recorded Tuesday, 12 February 2008.